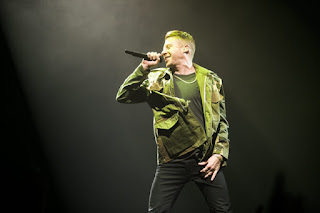 Random And Some: We want (Mackle)more! We want (Mackle)more! I love me some Macklemore. In just five short years, the Seattle-born rapper and Ryan Lewis, his producer buddy, have built up quite a résumé. Starting with Wing$ (2011), which I fell forever in love with thanks to a 'Bring Back the NBA' mix during the NBA Lockout, the hits pretty much keep coming. The song appeared on the duo's 2012 album 'The Heist', along with the unstoppable Can't Hold Us, gay rights anthem Same Love, smash hit Thrift Shop, and notable tracks like Ten Thousand Hours, White Walls and Victory Lap. Macklemore might try to convince you otherwise, but him and Ryan Lewis deservedly cleaned up at the Grammys in 2012, winning Best New Artist and three awards in the Rap category. When lead single Downtown was released on August 27, 2015, it was succinctly clear that Macklemore and Lewis would resume their hit-making ways on This Unruly Mess I've Made. The song, a slick collaboration with Melle Mel, Kool Moe Dee and Grandmaster Caz, is perhaps the biggest earworm in recent history.